The sign on the canopy says Olympic Theater Concert Hall, but originally this was the home of the Prospect Theatre, located on Prospect Avenue at its crossing with 160th Street and Westchester Avenue. There was an older Prospect Theatre on this location erected in 1910. The The Edison Monthly, vol. III, no. 9, Feb. 1911, pg 268, noted, "Four new theatres have been constructed in the Bronx within the last two years, and at the present time a fifth is nearly completed. These are the ... Prospect Theatre, at 160th Street and Prospect Avenue, erected by the Henry Morgenthau Company and controlled by Messrs Freiderich, Gerston & Baer ... The Prospect Theatre has a seating capacity of nearly fifteen hundred and in perfect equipment rivals many of the large new theatres downtown. It is cozy and homelike and the comfort of its patrons has been carefully considered. A complete and most modern lighting system has been installed. A softened effect is secured by obscure lights with the exception of the main ceiling, which is illuminated by a huge cluster chandelier of upward of one hundred lights. The lighting of the stage has been thoroughly studied to procure the most perfect scenic effects." The Real Estate Record and Builders' Guide, 26 November 1910, described the opening: "The Prospect Theatre at Prospect av and 160th st, in the Hunt's Point section of the Bronx, was formally opened last Saturday. The playhouse, which cost over $300,000, is one of the largest in the Bronx, having a seating capacity of 1,600, and is absolutely fireproof in every particular. The floors are of tile and cement both finished in neat colors harmonizing with the wall decorations which were produced by Mr Arthur Thomas." Architecture and Building, May 1911, also took note of this earlier Prospect Theatre, "The Prospect Theatre, which is located at 160th Street and Westchester and Prospect Avenues, in the Borough of Bronx, New York, was designed by Charles E. Horn. The interior decoration and mural paintings were designed and carried out by Arthur Brounet. A lunette in the outer vestibule typifies "Harmony" and the proscenium decoration represents "The Coronation of Theatrical Art." Both paintings are well studied compositions and are in sympathy with the general decoration and color scheme of the house. The Artificial Marble Works made the scagliola used for wainscoting and wall panelling. The switchboard for the stage and house lighting, which is made up of three marbleized slate panels carrying open knife switches with dimmers located below, was made by the Worcester Electric and Manufacturing Co., and installed by the Empire Engineering and Supply Co."
At some point this original Prospect Theatre was taken over by Benjamin S. Moss Theatrical Enterprises, and in December 1919, Variety reported, "The new Prospect theatre, which B. S. Moss is building at 161st street and Prospect avenue, Bronx,. will be ready to open May 1. The house will seat 3,500 persons and costs $1,000,000 to erect. The Coliseum, which Moss is erecting at 181st street and Broadway will also open about May 1." 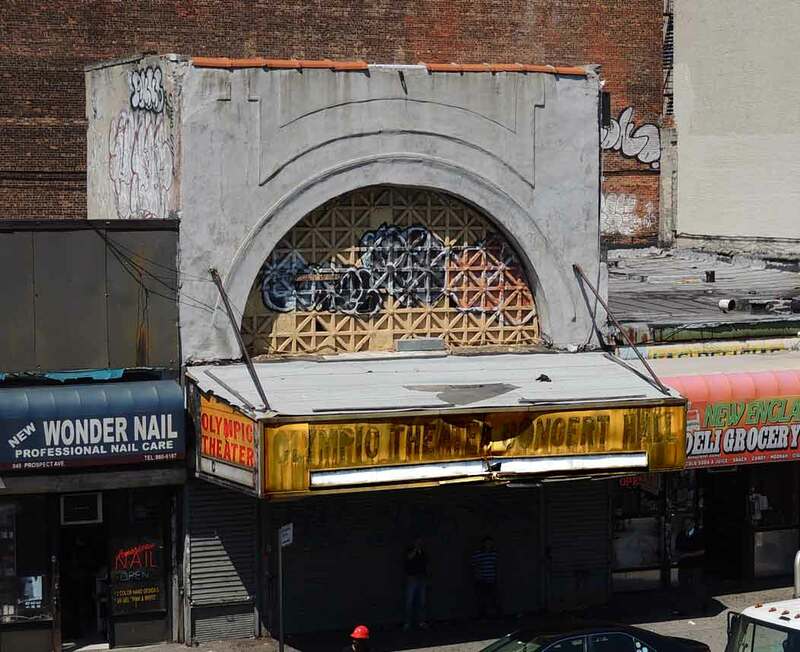 http://cinematreasures.org describes the Prospect Theatre in these terms, "Everyone who ever grew up in the South Bronx remembers the Prospect Theatre. It opened in 1918 and was operated by RKO for many years. In the late-1940's and early 1950's the Prospect Theatre was operated by the Cinema Circuit Corp. chain. Restored to its original beauty in 2000, it was used for live performances as the Olympic Theater Concert Hall until its recent closure in 2006." In 1925 Variety reported, "The fall and winter status of the Prospect Theatre (Prospect avenue, Bronx) has been defined. This house, which failed to produce box office results with Mutual burlesque last season, has been taken over by the Deerhorn Amusement Co. for a long period lease. Starting early in September, a mixed vaudeville policy will be launched, with four Yiddish acts and two English turns comprising the show." In 1928 the New York Times reported, "The Prospect Theatre, Prospect Avenue and 161st Street, Bronx, will begin a stock season tonight under the direction of Jules J. Leventhal, who operates other companies in and around New York. 'An American Tragedy' will be the first attraction. The Prospect heretofore has usually presented Yiddish drama." Then in 1934, "Signs that the new Yiddish theatrical season is gradually bestirring itself after a long interval of silence are made known in two announcements concerning outlying houses. For the coming season the Prospect Theatre in the Bronx will be operated by Nathan Goldberg and Jacob Jacobs, actor-managers. Before the opening early next month the theatre will be extensively renovated. The bills will consist of musical comedies, operettas and dramatic attractions." By the time of this photograph by Percy Loomis Sperr in the collections of the New York Public Library (1938), the Prospect Theatre had definitely become a movie theatre. Joan Bennett and Henry Fonda are featured in I Met My Love Again (released January 1938). The marquee proclaims "2 Big Features Every Day." Cinema Treasures includes this photograph among others, including some of the theatre's interior.